Article first published as TV Review: THE TICK on Seat42F. Before we get started with this review, I must confess, I’ve never seen any previous incarnation of The Tick. I’ve always meant to and I’m sure I would enjoy, but just never got around to it. So this article is purely about the new Amazon series. 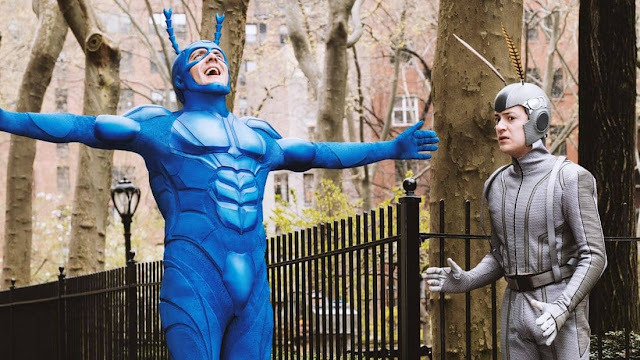 Amazon launched a new THE TICK yesterday, a second live-action version of the comic superhero spoof. Centered around a big, blue man in a bug suit and his more timid butterfly-like chum, The Tick fights for justice and doesn’t condone killing. With cartoonish jokes and supermen and women whose names themselves are gags, this occasionally meta, delightful absurd, woefully inane series is just getting warmed up. The lead character of THE TICK is not The Tick. No, that title, at least for these six episodes, should go to Arthur Everest (Griffin Newman, Vinyl). Arthur is arguably the unluckiest person alive, with a very traumatic childhood backstory. He does have mental health problems, but it’s a miracle that his problems aren’t crippling and he’s, more or less, leading a normal life, even if his nighttime activities are less than normal. Enter The Tick (Peter Serafinowicz, Guardians of the Galaxy), who takes Arthur’s unfortunate hobby and makes it his life. The Tick seems to come out of nowhere. Yet, he’s clearly got history with Arthur and has been around awhile (and not just because all of the heroes and villains in the show don’t seem to age over years or even decades). But The Tick doesn’t know what he is or who he is, only that Arthur has a destiny and The Tick must help him. If anything, it’s almost like The Tick is Arthur’s sidekick, even if their personalities point to the other way around. What follows are odd battles with people like Ms. Lint (Yara Martinez, Jane the Virgin), a woman who flows with electricity, making her a magnet for floating particles, and The Pyramid Gang. Everyone wants Arthur’s superhero suit, which isn’t really his, and there’s a bit of a comedy of errors as custody goes back and forth. Yet, there’s also a grander story here. Very early on, we know there’s something off about the original superhero who came to this planet more than one hundred years ago, Superian (Brendan Hines, Lie to Me). There’s also a naked VLM (Very Large Man, played by Ryan Woodle) who keeps growing and walking towards population centers. There’s the question as to whether the great villain The Terror (Jackie Earle Haley, Watchmen) is still alive. All of these moving pieces don’t fully come together in the first six episodes, which seem like an extended pilot. Normally in a show like this, I would assume there isn’t a great picture coming into focus, as this seems like a goofball comedy. Even without having seen the earlier versions, it seems unlikely they had such lofty goals. And yet, the more signs shown in each installment, the more it seems certain that THE TICK is going somewhere. Which makes it even better. And if you’re just wanting to tune in for the humor, there’s plenty of that, too. For instance, Ms. Lint lives with her ex-husband, a weird hipster named Derek (Bryan Greenberg, How to Make It in America), Arthur’s stepdad is way, way too nice, and Ramses IV (Michael Cerveris, Fringe) keeps a sarcophagus full of power drinks. Those are just a few of bizarre things in these installments. I’ve barely scratched the surface of what THE TICK contains. It mixes offbeat comedy with genuine superhero stories with deep mysteries with hyperreality with whatever the heck Overkill (Scott Speiser) is, plus the psychotic woman from The Following (Valorie Curry) plays Arthur’s sister. It defies easy explanation and is super addictive, as I quickly plowed through all six half hour installments in short order. THE TICK’s first half of its first season is available now on Amazon Prime.